BANGKOK (AP) — The two top parties began angling for the upper hand in forming a new government in Thailand on Monday after partial results showed no group won a majority of seats in the country’s first national election since a 2014 military coup. One outcome: many accusations of cheating in Sunday’s vote, in efforts to discredit the other side’s claim to leadership and perhaps get some winners disqualified. The allegations highlight continuing deep divisions in Thailand, which has been wracked by political instability for nearly two decades. The junta-appointed Election Commission announced the results of 350 constituency races but said full vote counts, which are needed to allocate 150 other seats in the House of Representatives, won’t be available until Friday after apparent counting problems. The partial results showed the military-backed Palang Pracharath party won the most popular votes nationwide. But under a complicated new electoral system put in place by the junta, the anti-military Pheu Thai party is likely to win the highest number of seats in the House. Each party insists its advantage gives it the right to try to form a government, though neither holds a majority in terms of votes or seats. And because an unelected 250-member Senate appointed by the junta will also vote for prime minister, a party must win a combined 376 votes to assure victory. That vote will likely take place sometime in May and give Palang Pracharath’s candidate, current junta Prime Minister Prayuth Chan-ocha, a considerable advantage. The election is the latest chapter in a nearly two-decade struggle pitching conservative forces including the military, courts and ultra-royalists against the political machine of former Prime Minister Thaksin Shinawatra, a tycoon who upended tradition-bound Thai politics with a populist political revolution and is now despised by the military. Thaksin now lives in exile abroad to avoid a prison term, but parties allied with him have won every election since 2001 despite repeated efforts by the military and courts to block his influence. 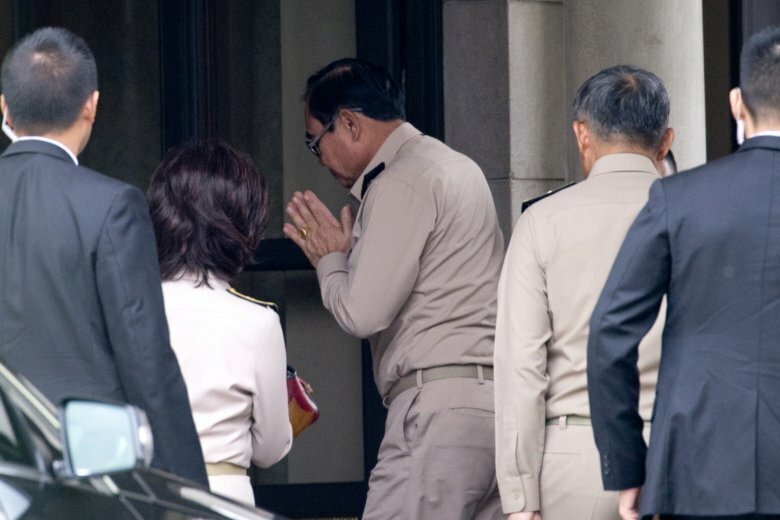 His sister, Yingluck Shinawatra, who led the Pheu Thai government that was ousted in 2014, also fled the country after what supporters said was a politically motivated prosecution. While behind-the-scenes recruitment of smaller parties is the main way for Palang Pracharath or Pheu Thai to try to gain enough support to form a government, the public battle is being fought with cries of foul on social media, mostly from Pheu Thai partisans. Although formal ties between Thaksin and Pheu Thai are now legally banned, he amplified the accusations of foul play in an op-ed in The New York Times on Monday. His complaints included inconsistent and delayed results from the Election Commission, ballot numbers exceeding voters in some areas, turnouts twice the number of registered voters, and a suspiciously large number of voided ballots. Thailand’s main poll-watching organizations have not yet publicly addressed most of the allegations. The watchdog group P-Net charged that the junta-appointed Election Commission was inefficient, and that it had found vote buying ahead of the voting. But there is concern about the other allegations. Allen Hicken, professor of political science at the University of Michigan, noted that while Thaksin’s words read as “sour grapes,” the allegations have been circulating widely. He said he considered the three most troubling issues to be the delayed result announcements, turnouts exceeding 100 percent and a large number of invalid ballots. The commission’s secretary-general, Charoongwit Poomma, defended its handling of Sunday’s vote and said delays in announcing full results reflect its duty to ensure the election is free and fair. He said he had not received reports of issues such as excessive voting numbers or disappearing votes. The cheating charges come on top of the judgment by many human rights and pro-democracy groups that the rules set by the junta made a fair election impossible. Palang Pracharath chief Uttama Savanayana said it will contact like-minded parties to form a new government. The leader of Pheu Thai, Sudarat Keyuraphan, also said it would try to form a government because it won the most constituency races. “The party with the most seats is the one that has received the confidence from the people to set up the government,” Sudarat said.